The Days of Johann, an agility dog! : This week is National Dog Bite Prevention Week! This week is National Dog Bite Prevention Week! This week is National Dog Bite Prevention week - a week to learn, educate, be aware and share info to keep you, your children and your pups as safe as can be. This week is National Dog Bite Prevention Week, which is designed to increase awareness of an all-too common problem: dog bites. Many people seem to think that a dog would "never" bite them, but the statistics show that every year, 4.7 million people in the U.S. are bitten by dogs. Even worse, sixty percent of those people are children. Every year, roughly 800,000 people require medical attention for dog bites, and about 12 people annually are actually killed in dog attacks. 1. In many rural areas, animal control resources are limited, so it's especially important that you gain an understanding why dogs bite and educate your children on dog safety. Statistically 50% of children will be bitten by a dog before their twelfth birthday. Don't let your child become part of that statistic! 2. Many dogs are friendly, so it's not like you have to walk around fearing every canine you meet. But it pays to be cautious. The majority of bites are from a dog the person knows. Never assume a dog is friendly; always ask the owner first (if one is around). 3. Dogs bite for three main reasons: to defend territory or to express fear or dominance. Often it's a combination of all three, so pay attention to the behavior of any unfamiliar dog. If he seems edgy, afraid, or behaves oddly, he's more likely to bite. 4. Don't look an unfamiliar dog straight in the eye. If a dog knocks you down, curl up into a ball and cover your face. 5. Teach your kids not to approach any dog that looks tense or aggressive. If a strange dog approaches, they should stand still. Make sure your kids also know that they should not run or scream. Teach your children not to tease dogs or disturb a dog when he's sleeping or eating. Also explain that they need to tell an adult whenever they see a stray dog or a dog that is acting "weird." Never leave little kids alone with a dog unsupervised. Thanks Susan for sharing these tips! 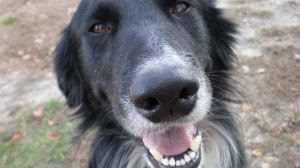 If you'd like additional information and resources that can really help you, your children and those you love stay dog bite free, visit this post with great links provided by the Humane Society of the United States. Check 'em out, get educated and share the info!